I like most of you have always found discovering the right stock to invest/trade in to be quite a challenge, considering most research websites out there focus on just single stock pages. We had also received a lot of requests for a screening tool. Presenting screener by smallcase – the most powerful & comprehensive stock screener for Indian stocks. With over 70 filters, readymade screens, exports & many more features – screener should help you find the best stocks for your investment thesis, faster & easier. More importantly, all data from the best source available – Thomson Reuters Knowledge Database and available exclusively only for Zerodha clients. Find below an introduction to screener from Vasanth, [email protected] smallcase. Here is a link to the webinar conducted on using screener Tuesday, 23rd May at 12.30 pm on our youtube channel. I congratulate you, being, zerodha as the most preferred trading platform, as preferred by most of the traders. Seems good service, is it pais service or free for all zerodha customers? How to login for the screener. Why would you need the authorization to access my holdings / place orders for using this service ? Have you develop any screener for day trading or not. If any such screener is developed please share. Nithin Kamath – Please fix all the problems in your platform before starting so many value added services. The UI is pathetic has issues with basic CRUD operation. Today one of my stocks went missing from portfolio, your support team is hunting the same as I speak. Your ideas are immensely great but with such a flaky platform you are going nowhere. I used to advertise Zerodha to all my friends which I regret now. Hey Vignesh, this looks like a case of short delivery. The person who sold the shares to you failed delivering. In such case the holding which was in T1 will not show as holdings. Check this post for more. Nithin Kamath – Still no word from your support team on the issue. Not even said they are investigating. Just asked my Client Id and never replied back`. The scrip in question is an XT scrip, looks like you’ve done a Buy/Sell trade in the stock on some day. Ideally , a buy/sell made on the same day would be considered an Intraday trade; however for such XT scrips, the sell would be delivered from your existing holdings while against the purchase, you would receive fresh delivery. When you do an intraday trade in such XT category with previous holdings, the platform/backoffice shows holdings on T+1 day and doesn’t show up on T+2 day. If you check your eod holdings of 18th, this will show up under T1 holdings. The stock has been delivered to your demat account today and would show up under holdings from tomorrow. Thanks Venu, Dont get much of it as I m no stock market expert. But did find the script in the CSDL report. Would have been happy if the same came from Zerodha support when I raised itself. From morning I m banging my head and questioning multiple forum on what would have happened? It does give a great confidence when a CEO/COO of the company reads customer queries and answer them. But what matters is the support capable of giving such answers. I know its discount brokerage shouldn’t expect much, still get frustrated when you dont get right answers. If I may reiterate you are providing great Value added services, but please do stabilize the platform before adding more n more. Appreciate that very much.. Please let me know if there is any portal/mailId to send feedback. There are many small issues, fixing which will improve the experience massively. We know that you are passionate about building your Zerodha platform but what was least expected is to have a fall back scenario at hard times. There was an incident 2weeks back in Zerodha Kite platform which took 2hrs to restart the servers….omg….can one afford too ??? My personal loss is Rs 98,500 becoz of system unavailability during that…infact I was in profit for the first 30Mins which was sufficient for Me book profit and exit. All we can do is look for better brokerage platform whichbis safe. Its fine if thy charge also that way our capitsl atleast protected. Exactly same advice from my side.. Some years ago I had lost 27k when my stop-loss was removed due to. Some platform migration. That was years ago but sad thing is that we still have many serious issues: 1) we can’t trade in India via and weekly bank nifty options 2) the option Martin charged for covered calls, covered puts and butterflies are crazy.. It should be equal to maximum possible loss as is the case with buying options. This severely limits our safe option trading 3) most importantly… We have kite.. Website crashing during market time for hours.. That is such a huge risk.. Imagine holding future say REC LTD and stock moves against you by say 10-15%.. While no fresh trades can be executed from Zerodha systems. 4) even checking PL and precious tax related info is hard to get.. When u apply filters you get absurd results..
All this must be addressed at top priority. Without these basic things it’s very painful to carry with Zerodha. People will move out on any opportunity. Even customer care is clueless most of the times. I agree. Lately there have been quite some problems. Platform unavailability being a major one. The cost price on one of my holdings went for a toss and hasn’t been fixed even after almost 6 weeks. Holdings are not matching b/w Kite & Small Case….Stocks missing despite showing in Cotract notes? If a certain stock you have bought is not showing up, it must be because it is short delivered. Can you email [email protected] with your client ID. I wanted to sell my ICICI holding but stock was missing in the kite platform and the stock moved against me. I used to advertise zerodha but after last 2 months I don’t. I totally agree with Vigenesh, the ideas are great and I really respect and value them, but the foundation of anything done is flaky. U add buy/sell after 3:00PM, it will take a good 2 minutes to put the order in Kite. On market panic or Euphoria days, I am forced to use the trade.zerodha which I hate to use in case I need to buy/sell else simply loose the oppurtunity. IPO applying which is basic has to be done via ASBA and there is no update when it will be easy to apply at the click of a button like my friends at competitors do. For any issue that you call, even with Zpin sometimes it just tries the patience that you just cut the call, in case you get through, CS hardly has correct answers. Sorry to say that most of the times they are terrible. In very rare case, I have had them solve the issue. Contract notes – there are at least 2-3 instances where in I have had to write and request for it while the blame was on technology for it not having reached me. At least 2 instances where in someone’s contact notes is in my mailbox. Writing to Hanan will only get apology e-mail despite requesting for a call back as CS will never connect to him. It is not only me but there are many in my technicals learning FB group who constantly post of issues in Zerodha. Like you I used to advertise Zerodha in the beginning, now I simply opened an account with Sharekhan. At least I don’t miss out on the opportunity of buying or selling a stock on prime days at prime times even though I need to pay some minimum brokerage. If what is promised is true this will be a great addition to Zerodha. I was searching many websites for this and zerodha itself gave us this! Just install IIFL app for getting price alert. You no need to open account with them to use price alert service. Was waiting for this feature for long time as many of the competition Brokerage houses already have it. But better late than never. Hope this will help investors in increasing their wealth. Thank you Zerodha. Well done team, looking forward to the screener application. This kind of analytics will surely help the traders & investors. Awesome!!!! Can this be integrated in the app? When is the app coming out of beta? Great Initiative…. Been looking for a good screener for quite some time now…. Mr nitin this is not related to the topic above but please develop an live option chain with live greeks . And IV rank and IV percentile , I think only myfno provides this service , would be great if zerodha also does this with some charge also would be fine . Is it available in play store also? Can we have an app for website like smallcase? Firstly a big thank you for everything!!! Now regarding the Screener….great initiative! But being zerodha I would l;ike you guys to go full on flexible in terms of creating screens and give max power to the person trying to screen. For example I would like to check for all the stocks that have traded double in volume today over their 50 day MA volume. Something like that. But most screeners dont do that. Instead there would be a standardized 10 day average screen or something. But Nithin man! Thank you!!! Your multitude support for retail investors is laudable. Good. I am expecting this screen filter for right stock selection. Thanks Zerodha team. Brilliant stuff ! This is the reason we stay in Zerodha ! Thanks Nithin and team ! The smallcase app functionality needs improvement. Screener is a welcome step. You proved again that Zerodha is years ahead of competition in providing customer service. This looks good and congratulations for this. I tried to use it but small case required some permission … i have issues with only one of them… why would they need permission to place orders?. Is there a way around without this permission? That’s great but I see a lot of difference in candlestick charts between kite and pi. While Pi shows correct candles, kite and app based charts show different candles altogether. What’s wrong? sir please add screener for day and positional trading . so we can easily choose stock for trade just like sharekhan. if you do this all client decide to trade in zerodha.may be your income become double .we face to filtering stock .so we have done filtering in SK then trade in ZD.you also improve market watch and increase as big as . so offenly we dont search and analysis and trade.put ready amd market watch like nifty, bank nifty ,metal nifty,all indices .so every one see on one click.also put all sector and indices for sector analisis. by the way your kit website plateform superioer than SK. THANKS. please comapre Pi with SK .you got IDEA about very user frendly Trade tiger .easy market serch easy predifiend filter screener. please do something i am waiting for favorable response. Thank you so much. It is a great Initiative. Congratulations to whoie Zerodha team. Very nice. I have checked traderscockpit as advanced screening system. Happy to hear that Zerodha is coming with such advanced screeners. Screener app want permission to create, modify, cancel trade orders on our behalf while i tried logging in using my kite credentials , is it ok? what a third party application need this permission ? It is okay. If tomorrow you want to place orders through smallcase, you will be able to, hence the permission requirement. Is small case charging for placing the order ? for screener you have set the fees of 100 per month.How about small case is there some charges applicable ? Will the small case charges of Rs 100 apply for premium accounts also? This is much appreciated release!! Kindly release an app for Windows Phones as well. Sounds good, thank you for this. Seems pretty interesting. Do we have a dedicated app for this for mobile platform. Since I am facing a lot of difficulty in using the website on chrome mobile with screen not showing in full, filters are overlapping each other etc. Overall a really appreciable initiative. Will be a more than perfect if we can get an app for it. Thanks team zerodha and team smallcase. First I would like to congratulate Zerodha for making very user friendly and by far the best app Kite. Looking forward for screener. Cheers!! This will serve as one stop solution . Rs. 100 per month seems to be high. You must be using​ the same screener for building and rebalancing smallcases. Why duplicate the effort? The company is adding a new tool to the customer. I take the occasion to you and your team to give necessary gide to the customer . wish you all the best. i have activated screen pro .want to know that how can i use it? Can we have a demo of the feature plz? Appreciated your nice initiative on this front !!! can you please let us know is Basic Filter like Money Minters, Deals to Setal, Low-debt Midcaps, Income Stocks etc are free of cost for ever and only Premium plan is charged @ 100 / month i.e. 1200 yearly after 14 day Trial? Thanks for reply .. It will be gr8 help if you keep this free…reason being… people like me who is new to stock market and started investing after referring to your YouTube, online documentation and after liking your views of promoting new bees like me to invest in stock .. I believe making this initiative free will prompt more user to get in touch with Zerodha as discount brokerage provider. Why screener is paid service? That too rs 100 per month as promotional offer. why to go for it , if free screeners already available? This is amazing. Cant wait to sing up for zerodha screener premium. Great job!!! well done zerodha !! This will diffinitely help to the biginer like me. Great to hear. I really appreciate the add on services you are providing. Hats off for that BUT only 1 issue I fear with Zerodha is DOWNTIME DURING MARKET HOURS very risky as large sum of money can be lost.I WILL BE HAPPY IF YOU RECTIFY THIS ISSUE WITH TOP PRIORITY. Is it helpful or not plz ensure me & how to use it ? Good job done and thank you for making Zerodha further comprehensive and integrated trading platform. thank you for making Zerodha further comprehensive and integrated trading platform. Looking for the intraday scanner. Please develop. sir is this screener usful in option strategy? It’s good to see stock screener from zerodha. But it is for investment purpose (connected with smallcase). How can i use it for Intraday trading or positional trading 9 for 5 days) ? I had everything for stock analysis except this VERY VITAL ONE. Was looking forward to such an app, but your permissions required are a spoiler/ criminal, rather. Why should I authorize a screener app to buy/sell on my behalf?? Would you all pay lakhs in damage if your software screws up and places foul orders? Just be an aide service, instead of risking our portfolio order management. Can we filter stocks, which are currently approaching its near or long term resistance or support level?? If not, then make this type of filter for us. We need to have template to submit option startegies orders in one go. Support team mentioned that this is under development. When can we expect this feature live? Is this useful for intraday trading? I would also agree with Vignesh. Though we are attracted to Zerodha due to all these wonderful additions, robustness of the platform has to be first looked uopn. Been facing several issues with my values turning to NA now and then, had issues with T1 ( still my loss hasn’t been compensated due to your glitch. Been following pathetically for long), avg cost disappears etc. Been apprehensive on recommending Zerodha to others. Excellent work. I want to understand if I there is anyway to ANALYSE CANDLE STICK patterns and get ALERTS when a particular candlestick pattern (a single candle stick pattern or Multiple Candle stick patterns). It is like custom screener capability where screener can be defined by end users like me. Does it has daily volatility feature? Congrats for coming up with innovative ideas, one after the other. Nice tool! Many times there are stock tips and recommendations from brokerages. How to use use this tool to evaluate and verify the stock? Hey Sunil – we have a couple of filters in screener for the same – do read more here https://talk.smallcase.com/modules/evaluating-stocks/broker-ratings/ This helps? Great initiative.. But please improve your support. I’ve opened a ticket to enable MF for my account but still the ticket is open and no response. Is the technical team not aware how to enable the MF???.. and there is no escalation mail ids to report such a long pending issues. It is useful for investment may be not useful for intraday trading. Any ideas to use in intraday trading from your side. That’s what you call it the most powerful platform for trading with Zerodha. They have tools for beginners and for the advance traders as well! 1)29 out of 70 filters are for premium users. Premium fees are being charged for monthly basis, once activated, whether we use the scanner or not. 2) Small case is charging Rs.100/- for every new small case purchased first time. 4) Open BO/CO/MIS orders will be charged for Rs.20/- , no-matter we could not sq-off our position due to the glitch in your platform. hmm… If the business doesn’t earn, how will it sustain.If it doesn’t earn, how will we build new products? Coin promotes direct mutual funds, we don’t earn anything from the AMC anymore. BO/CO/MIS square off from our side, puts unnecessary load. We want clients to square this off on their own, we are hoping the charge will get people do it. Then charge regular brokerage and give all these services free like other brokers or else stop calling yourself discount brokerage. Further, on this screener, any stock got selected by given parameters, is not be clickable for further research. Many important filters are only for paid users, so it is of no use for me to filter and shortlist further. Many other screeners are doing this job for free. Why can’t Zerodha? When earned whooping profit in last 2 yrs. What is the point of calling urself discount broker, when you keep on adding half cooked ideas like coin, balance and now screener and charging to clients. Shreya, there is no compulsion for using any of these products. You can still trade with us paying “Zero” brokerage on your equity investments and Rs 20/trade for everything else. Sure, that’s what i m doing. Thank god, i have my value investment portfolio with a good and sound broker(who do not have such hidden charges in the name of discount broker) than Zerodha. Hi guys, the platform looks really great. Congratulations! One question, anyway that the user can search and look up specific companies on their own instead of using the filters? While trying to login with zerodha credentials, it is asking our account to be viewed but why it is asking for authorization to change the orders? Hi Surya, on the list. Thanks! Hi there, it’s a great initiative. Can we also screen the daily highs and lows of the market in live time and also can we screen for stocks which has higher buyers than sellers and vice versa? Hello Satish – no right now these options are not present in the screener. But we would soon increase our list of filters, based on the user feedback and will definitely consider these filters. I have recently joined Zerodha. Kite seems very user friendly, except that it has five marketwatchs, which take only few scrips each (20, in number, I believe) and there is no way they can be put in alphabetic order. Can the no. Of scrips to be put on marketwatch be increased and put in alphabetic order, say like in Zerodha pi, money control etc. For a trader like me who has a large diversified portfolio, this is very necessary. Secondly, can we also screen the daily highs and lows of the market in live time and also can we screen for stocks which has higher buyers than sellers and vice versa? What is the fee for each smallcase: RS. 100 or RS. 200 per month? Is it similar to a PMS, minus requirement of large investment? Is there any exit load/fee? Who does the balancing of portfolio and when? Is there any fee for the same? Why have so many of them instead a few based on focussed themes? What is the period for which it would be advised to stay invested in a smallcase? Hey Mahen, sorting will be introduced in the upcoming update to Kite. As for increasing the MarketWatch limit, we’ll explore it going forward. I want to know something..
1. screener Is it free??? 3. can it helps to trade in intraday??? How much would it be for reactivation if cancelled in between? Because for API reactivation, I see now a sudden charge of Rs. 2000 being asked on Developer page. I would like Zerodha to be transparent with their users. As of i knew Trader’s Cockpit is the best screener website in the market. Let’s hope Zerodha will fulfil my advanced screener requirements. But I feel like this scanner is not even par with the freely available on net. Not criticizing, but felt like that after going through it.. Please enlighten me if anyone already gone through it. 1000% agree with you. Many free screeners are much more versatile than this one. In smallcase screener, there are no option to screen stock as per bollinger bands criteria. Please could you work on decoding the PMS also….for small investor….Thanks…Tanveer. 1.A filter Earnings quality rank is showing worst earners on 1-10 n good ones on 70-100. We ll need some description/info about such index. 2. In export csv feature, only the loaded page is converted to csv. If there are multiple pages for an applied filter, we have to Individually download csv from each page and recombine them for study/analysis purpose. 3. Please add a search bar for filter as well, that ll be very useful. But downloading of results should either be free or charged only in the month when used. User Interface is also not very intuitive for what is a simple filter. This clearly looks like third party application and I have gave all the permissions to access my Zerodha account and modify orders. Is it very safe and secure to use and does it maintain very high level of privacy and security. Please reply anyone. I am worried. There are no issues Ravinder, screener and smallcase is as good as Kite trading application. Orders can be placed only when you place it manually. No worries here Ravinder – we can only access your Zerodha account when you’re logged in to check if you have sufficient funds to buy a particular smallcase & we only place orders on your behalf when you give manual approval for the same. Happy screening! Congrats! !, as i have written to you & Hannan many times before you need to fix the serious issues with your order management system before you embark on new initiatives, your good intentions are appreciated but thousands of your traders/customers are losing serious amount of money every time your order management system fezzes and this has been happening quite frequently now, you may argue you are providing lower brokerage and higher leverage, fine but all these savings and more will get wiped out in one single shot due to the issues associated with your order management system. hope you will ensure this fiasco with your order management system and your platform in general is not repeated once again. why do you need access to Place, modify, and cancel my orders. Hi Ritesh – These are primarily for buying smallcases. we can only access your Zerodha account when you’re logged in to check if you have sufficient funds to buy a portfolio/smallcase of stocks created from screener & we only place orders on your behalf when you give manual approval for the same. No worries here! Place, modify, and cancel orders. can you explain me why it is need???? Hi Sarfaraj – These are primarily for buying smallcases. we can only access your Zerodha account when you’re logged in to check if you have sufficient funds to buy a portfolio/smallcase of stocks created from screener & we only place orders on your behalf when you give manual approval for the same. No worries here! Nitin if you just have enough common sense then please work on trading platform first that is more important. Using your screener if i make any position and face loss due to trading platform issues then what is the use of your screener. Even most of the time kite app doesn’t display chart properly. Do you really not known about these issues or you just don’t want to give attention to this. Please Nitin use your common sense trading platform is more important than this screener. Its surprising that you paid attention to requests for screener but you just ignored so many people requesting for fixing trading platform issues. I don’t know whether you will read my comment or not. Anand, these are two different things, there will be different teams working on different products. 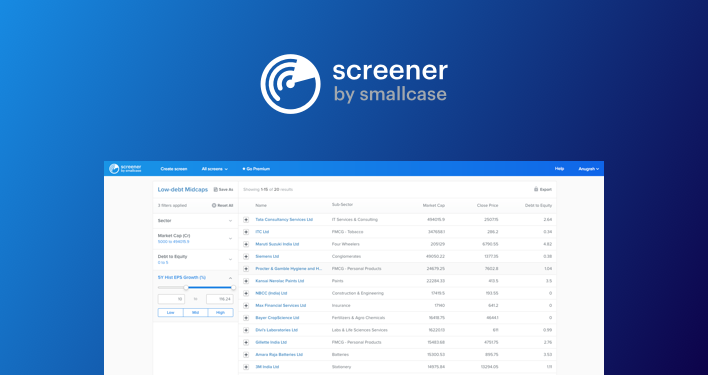 Screener is built by smallcase who has nothing to do with the team who looks after the execution platform. We are working constantly on ensuring the trading platform keeps getting better. Congratulations to your team on a new product. However I am bit disappointed not to see Trailing and forward EV/EBITDA Ratios in valuation filters. Hopefully your team adds these as well. This is a great initiative for novice investors like me. I do some basic research, but to justify those researches I did not have proper references. Now this platform of screener has given me that. So any stocks I want to research can be done in a jiffy and applying relative filters. Also connecting it to Smallcase was really good where we can buy shares by creating new cases. Sir waiting for Quant, when we can expect for this? Seems UI needs a Bit refining. There are overlays where it hides the information in certain scenario’s. Hello Nagasubramanian – where do you see this? Can you send a mail with screenshots to screener @smallcase.com? tried to use smallcase filter today morning using zerodha kite user id and password. 1. The content of the website not mobile friendly.. please make an app like kite. I hope this adds REAL value to us/customers/me, have invested in 6 small cases/40 plus stocks, 29 are in the negative as of now, though marginally. Best of Zerodha what I like is they are coming up with new and simplifying method,also they are trying to teach the beginner hence changing the concept and way of investing in stock market….means they are trying to improve themselves every time.Best of luck for the future. The idea to introduce screener is good, but it is not clear as to why the following permissions are required to be given at the time of login if any client’s sole purpose is to simply use the screener. The third permission seems to be more risky. Will appreciate a revert. Hello! – These are primarily for buying smallcases. we can only access your Zerodha account when you’re logged in to check if you have sufficient funds to buy a portfolio/smallcase of stocks created from screener & we only place orders on your behalf when you give manual approval for the same. No worries here! They provide all above at free of cost. Hello Zerodha is it required Premium plan ? We can’t & won’t place orders without your approval each time. No worries here! I am not able to load any results with screener, it is just blank screen and there is no button on the left side which says load results or search. I select all the filters and then its just blank screen on right side. let me know if am doing anything wrong. Congratulations for another Fremium product by Zerodha. I have transferred the script to my demat account by DI slip, when I enter buy price in Q-backoffice, it doesn’t reflect in Kite and I didn’t get my exact portfolio value. I have opened the support ticket (# – 857404) on 5th may, but support team unable to resolve the ticket from last 18 days, please help them to resolve the ticket. Incredible tool! I hope Zerodha is up for a F&O strategy creator tool integrated with smallcase for efficient strategy creation and one-point execution. If not, I think it will be a win-win for all as F&O has higher brokerages too. great job…thank you team zerodha..
sorry… got it…im new to this. and what about FII Inflow? is it with in institutional ownership? Could you please also let me know if i can find Broke out Stocks and 100 DMA crossed stock. The idea is very nice. But why no stock is loading? Is it browser dependent? Should be loading – can you check on a Chrome/Firefox browser? Please check my email where I have attached a screenshot. I am using firefox in ubuntu. The screener is good but we have to pay for full version.We need robust PI which has Ichimoku Cloud indicator. I have been asking Support team include this indicator they are helpless. As per blog, you have mentioned Ichimoku indicator will be included in coming version. it has been a year but no action taken. we can not use Kite effectively as it is slow and doesn’t have scripting option. Stil Wait for Ichimoku indicator…..
it seems screener not updating on daily basis …close price what illi am seeing is of one day old. I think, Data is not updated even EOD, prices are mismatch even with last day close prices. As a arbitrager trader, I need updated prices at least every morning and EOD. Please guide what is the solution. Can you please launch it as an app. It’s way more convenient than the desktop thing. Looking forward to it. I find smallcase awesome. Suggestion: Can you please prebuild and publish screens for every published Smallcase, with all their applicable filters – at least, wherever possible, say, for the Model-based Smallcases, etc? As of now, we have set of pre-built Screens, and pre-built SmallCases separately, not co-related easily. I am new Zeroda user. Can I use this tool free of charge? Can all this raw data be obtained programmatically via APIs? So those doing algo trading via Zerodha Kite won’t be able to use this data from their code? That’s a serious handicap. Thanks Vasanth. You should however seriously consider making this data accessible via Kite APIs in real time. I do algo trading, and can assure you that data like this can be quite valuable in the right hands for day trading as well. Is there a way we can at least manually download all this data at the end of the day? If yes, what can and can’t be downloaded? when I tried to register with smallcase as zerodha client , it asks to AUTHORIZE the small case app to Place , Modify , and Cancel Orders, and also want my account info such as my holdings and money balance in the account TO BE SHARED WITH SMALL CASE, this is crazy man, its a serious security issue with this small case app, so guys beware before using it. AND I reject it to authorize the app, so it don’t let me log in. sir when you are launching next version of quant? I missed out the live streaming Volatility based stop loss technique with Karthik Rangappa. Can you please upload the video in you tube or kindly provide me the link for the video. My id Do0042.Omprakash. There was an issue where it got deleted. We will record again and post it. the page https://screener.smallcase.com/ is not opening in IE / Chrome. Hi Sarang – can you try once in Firefox? Or send us a mail at [email protected]? It will be really helpful, if there could be any direct link to smallcase in kite platform so that we can access it directly once we login to our platform. We have different links like Mutual Funds,Q-Backoffice,Pulse etc. So in this if you could add smallcase link then it will be very easy for us to navigate to smallcase(only on a button click ) without logging again. Once I login into smallcase, i could see some 1600 stocks in list by default. could you help me understand it what basis it got fetch. And please include search option to check about particular stock and sector. I feel its tough to search for particular stock by surfing through entire list. if there is a filter for ` daily news+ events+ analysis = ranking’ of a stock would be great idea….thank you. I have noticed another major issue with your portal. Take example of SAMKRG shares last traded price of this share as per BSE webiste and other website is 288.80 on 31 May 2017. Zerodha portal shows 286.10 which means people are making loss. I have taken relevant screenshots to highlight this issue. http://www.bseindia.com/stock-share-price/samkrg-pistons–rings-ltd/samkrg/520075/, check the chart, 3.30 pm price is 286.1. Looks like the price changed at 4pm (like an after market close). Checking on this. I appreciate and thank you and your team for your efforts. Find below my suggestions to be included in the Screener. 1. Include the Index Constituents Filter. 2. Under Price and Volume Filter include 3M Return option. Please visit http://www.motilaloswal.com/markets/stock-market-live/gainers.aspx for clarity on my suggestions. Whats the difference in Free version and Pro version? Is there any video done on using the screener to its optimum? ANY FILTERS ON FNO STOCKS FOR ACTIVE TRADERS? Is there any plan to build a Stock Market simulator like MoneyBhai where I can trade stocks, buy mutual funds etc. virtually. I think, India really needs a good learning platform like that. Only you people can do it, as I found your apps and services are more intuitive than others. Please add it to your list if you don’t have any plans to implement it currently. I have multiple watchlists of stocks based on multiple themes, events and my personal picks. It takes multiple tools, factors to shortlist amongst them. Can you please consider applying this screener on custom list of stocks ? It will be easy to shortlist further. the screen just does not load, it keeps rotating endlessly for hours, are the servers down today, what is the issue ? I want to bring to your attention ticket #435928. Basically, I raised a concern on why RSI (which is a mathematical calculation) differs between screener and on Kite. Both sides are saying they are right but for REPCO homes screener shows an RSI of 16-18 whereas on Kite it is 59. Small case team was kind enough and provided the calculation but why can’t both teams get together and provide an excel sheet with calculations for RSI and RSI exponential for script in question. I don’t see any downside to it instead of keep lobbing ball in each other’s’ court. Vasanth, can maybe tell you the formula used on Screener. Btw, smallcase screener is an end of day screener, which means it updates only once every night. Kite indicators are live. Technical indicators includes moving average? Thus we can see (get) list of all stock above and below 5, 12, 22, 50, 150, 200 etc days moving average. How about days moving averages? I mean can we specify user specific days moving average (5, 20 days) and get a list of stocks? Can you explain the formula used for calculation of RSI and RSI Exponential used in Smallcase Screener. Would love if the UI/UX of the Screener is more refined, interactive charts are added & peer comparison! Otherwise how is it even gonna benefit the value investors? Do you have anything planned for value investors? i really wonder from where did you get that 89% buy rec at this point….strange….i think you just collect some dead numbers n upload on screener.. my request is atleast MAKE THE NUMBERS LIVE or you will lose credibility..
Can I use Margin or leverage for delivery orders? Why don’t you add screener for 5/20 EMS crossovers etc. with other parameters for trading purpose in daily chart. As you have mentioned, the data on screener is updated everyday at 6:30 am. Are efforts in progress to do the updation in the evening itself (3 to 4 hours after the market closes) instead of doing it the next morning? If not, then we request you to please take this issue on priority. Would be a great help for us in analyzing as we will have much more time on our hands to make the correct decisions. cash and carry filter is working perfectly? Vguard industries ltd ; spot price- fair value spread -future price are really matching? can you pls check n reply…. Hi sat – seems to be fine here, anything specific that seems to be wrong? on screener yesterday’s vguard closing price 178 and future price 194….how? it seems there is one trading day price difference between future and spot ….future price is not being updated with spot price…. The highest Call OI strike and Put OI strike for Lupin is 1200. What does that mean? Please comment. It is required to have the charting from kite integrated here. One has to switch between applications to get different data. Hi Vasanth, Can i create the screener for Magic Formula Investing on smallcase to check the veracity of the formula being used in small case? Reason for asking is – I see a different set of results in other websites like screener.in for example. Is there a filter to remove regulated sectors like Utility and Banking? The smallcase refreshes the portfolio every 3 months. Magic Formula recommends it to be left undisturbed for one year. Is there an option to leave it for 1 year? Is it possible to open screener while logged in Pi. If not, do you have any plan ?. Also do you have any plan to come up with screener for intraday in cash and F&O ? There is a way around to use screener while using Pi. First log in to screener and then login to Pi. Fno screeners are already available. Thanks about the login reply. Is it safe using F & O screener for intraday ? Do you have any plan to come up with any new screeners in the near future ? I purchased some shares through screener and sold (by mistake) via Pi. They are still shown in smallcase. How can it be removed from smallcase. I love all the features of screener. Here are some more additional features I would request you. 1. Price momentum Rank is actually wonderful feature. However it is a static feature. I request you to make it more dynamic like being able to rank Sectors against sectors, Stocks against indices etc.. and also the time should be configurable, like that of calculating against 1 week or 40 Weeks or 12 months etc..
2. Can Bollinger Bandwidth indicator be added? 3. There is an extraordinary setup called Bollinger Squeeze, Can it be found through Screener? For the first point about making Price momentum Rank more dynamic – It could be a long term enhancement but can you add 3 months Price Momentum rank and 6 Months Price Momentum Rank keeping 12 month Price Momentum Rank. This should be easy and quick. i want to close my smallcase screener account. which was previously linked by my zerodha account. why does it require authorization for placing and modifying the orders? can this app place order without my permission? Why is it necessary to access my holdings and positions details? And in terms and conditions it is clearly mentioned that small case can place sell and modify orders.. What does it mean? Account balance is sufficient to know. It’s difficult to provide such permissions and it’s risky too. Is there any option to check fundamentals and earning details of any company in zerodha? Other platforms suggest good picks to invest into but in zerodha we don’t have such facility. Is it safe to authorize this small case screener to access my holdings and like place order? I want to use this feature but bit concerned about security. please confirm. any plans for realtime scanner in future , may be on hourly on daily chart ?? “lower high, lower low” . Can any one help what is the actual script to be written? I think screener is for only daily. Is it for intraday also? For now, the screener shows only EOD data. I have been waiting for this for such a long time…Thank you so much for making this. Just one thing I want to tell you and i.e. why smallcase screener is only showing stocks listed on NSE ? Why stocks on BSE are not available… I mean there are around 1600 stocks on NSE and on BSE there are more than 5000. So it will be very helpful if you are giving this same facility for the stocks listed on BSE. Anyways good job. Zerodha is charging me for screener every month even though i am not using nor i never subscribed for any subscription. Please do let me know how i can unsubscribe. Hi Amol! You would only be charged a recurring fee if you have opted for a Tickertape (formerly screener) Pro membership. The same should be communicated at the time of signing up for the trial and through e-mails. However, we’d be happy to double check your membership details for you. Please drop a mail to [email protected] with the ID you signed up for Tickertape screener with, so we can check this for you.